Every business sometime or another needs to have a sign fixed in some way shape or form. It might be a simple light bulb replacement or a a complete retro-fitting of the current sign or that wooden signage has lost its luster and looks dull. Do not panic, we are here to guide you through the process and provide you with the best solution possible. The experience of our service team is unsurpassed and we have maintained and or completed jobs of all types and sizes. Whether you are a small mom and pop shop or a large nationally recognized company, we got it covered no matter what your company size. Simple window displays all the way up to lighted channel letters and panel or pylon signs. 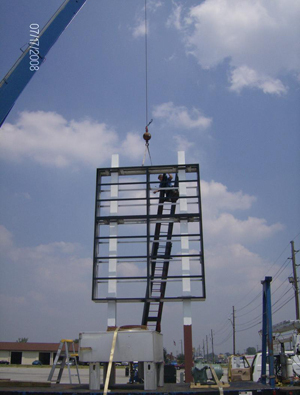 You can check out the different sign products we create and service to better determine what needs done. Once you are ready, feel free to reach out to us with any further questions. Your sign is your brand. Presenting a proper sign that is fully functional and display’s a clear and concise message is a important part of your business. Your business sign can be seen all the time, day and night; 24/7. If your sign is improperly lit or just unreadable because of bad lighting or a improper design it goes unnoticed. Now is the time to fix it, stop letting that potential business drive right on by your place of business. Each and everyday, thousands of possible customers are getting away. You are loosing on brand building and literally throwing money away by not having a actively functional and perfectly designed sign. 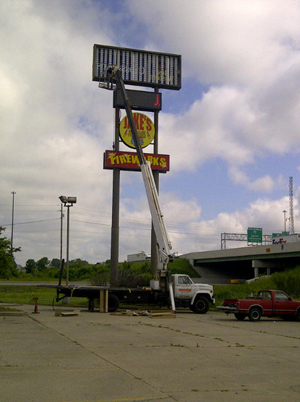 Let our design staff help you create that new sign or have us come out to repair or replace that damaged sign immediately. Because if it is not a priority for you and your company, it should be a priority.